Hey everyone! I hope your 2018 has gotten off to a wonderful start, and if not, I have just the thing. 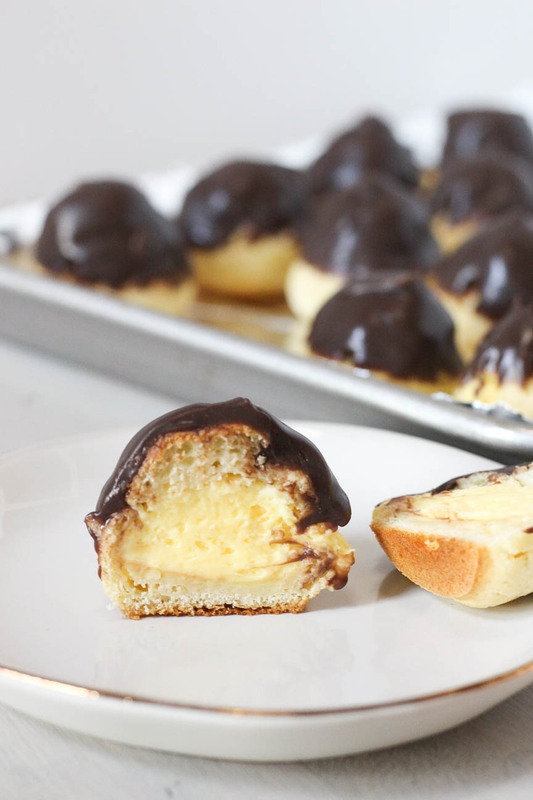 Today we’re making cream puffs. I said we because honestly you guys, you have to make these. 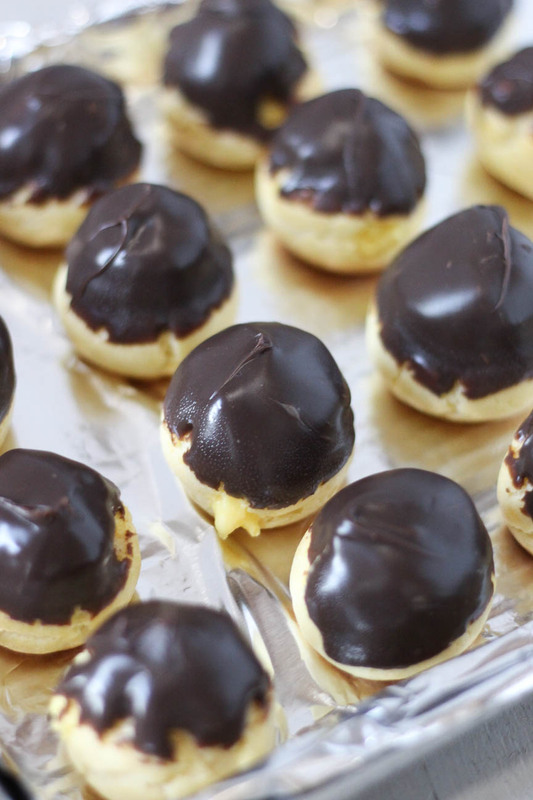 If you’re anything like me, cream puffs and eclairs and all that, it seems like some high-tech pastry stuff. But really, it’s so easy, and you’re gonna feel like a champ when it’s done. I dipped mine in a thick, glossy chocolate ganache, which really blends well with this shortcut french vanilla filling. So here’s the thing- this is actually a revamp of an old recipe of mine, and it deserved another look. The filling here is the real star, and it’s so flippin’ easy you won’t believe it. Sometimes I’m all for making everything from scratch and doing the whole pastry cream thing, and I promise I wouldn’t substitute if the results weren’t truly fantastic. Turns out, if you whip up instant pudding mix with some milk AND some heavy cream, you end up with this mousse-like substance that will change your life. Use it to fill these babies, but also use it for pies and parfaits and anything else ever. Seriously. Anyways, back to the puffs themselves. 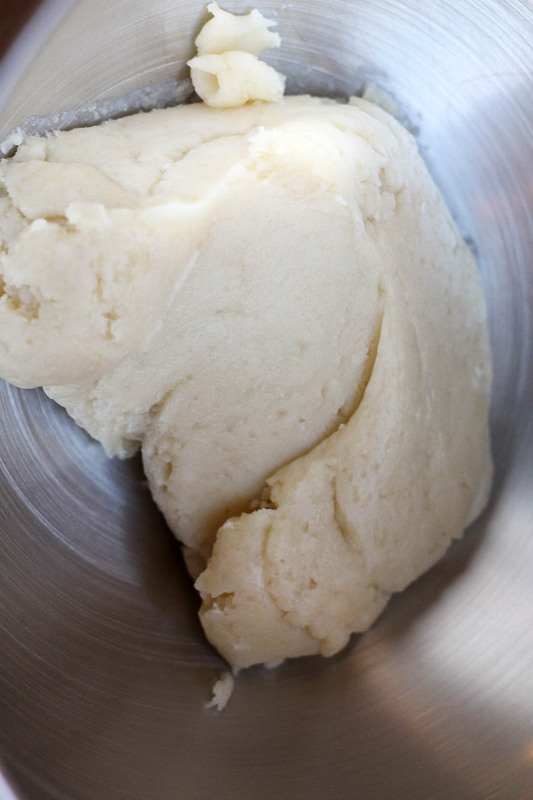 The process for the dough is actually really simple and easy, and it just requires a few minutes on the stove, and another few in the stand mixer. 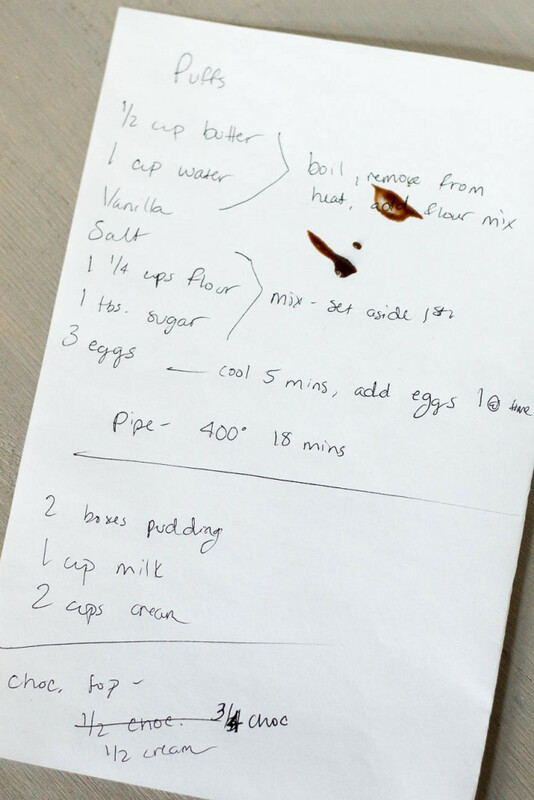 On the other hand- you can totally do this by hand without a mixer, it’ll just take a little elbow grease. You got this. I do recommend that you use a piping bag and a wide tip to pipe out the dough, but you can also spoon it out. It’s just a bit easier to get the right shape if you pipe it. Regardless of your method here, you can wet your fingers with water to shape the dough or press down any pointy edges. These are super pretty in the end, and I hope you make them and they knock the socks off of everyone you know (they will). Happy 2018 everyone! Add the water and vanilla into the melted butter, and turn the heat up to medium-high. Heat the mixture until boiling. Remove from the heat, and immediately stir in the flour mixture. Continue to work in the flour until it is completely incorporated- the dough will be very thick (see image above). 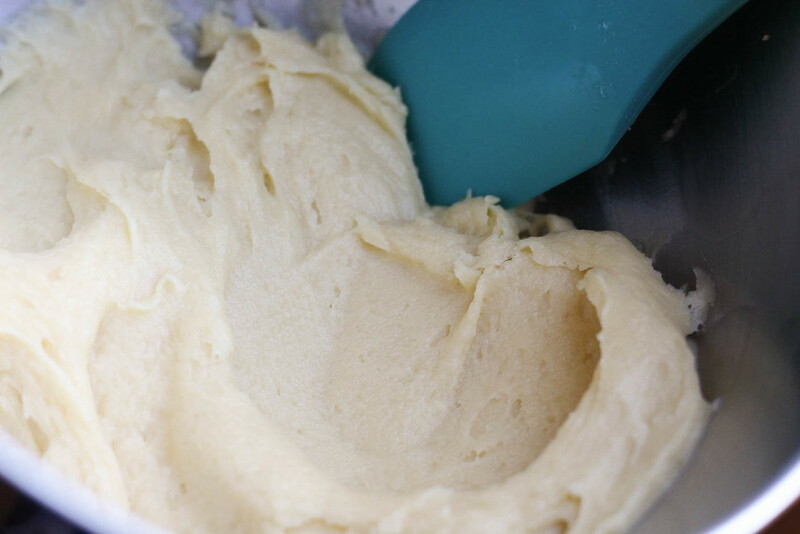 Transfer the dough to the bowl of a stand mixer, or to a mixing bowl if you plan to do it by hand. Let the dough cool for 5-10 minutes. Stir in the eggs, one at a time, mixing fully between each addition. The dough will become smooth and stretchy (see image above). Transfer to a piping bag with a large tube tip on it (I use the Ateco 808 tip), and pipe the puffs onto your prepared baking sheet, about 2 tablespoons of dough per puff. You'll end up with some pointy tops or edges no matter how you pipe them. Wet your fingers with water to press down any pointy edges and further shape the puffs if needed. Bake for 18-20 minutes, or until they have puffed up, cracked, and are golden brown. Cool completely before filling. Heat the heavy cream in your microwave until boiling. Whisk in the chocolate chips, salt, and vanilla until the mixture is smooth. 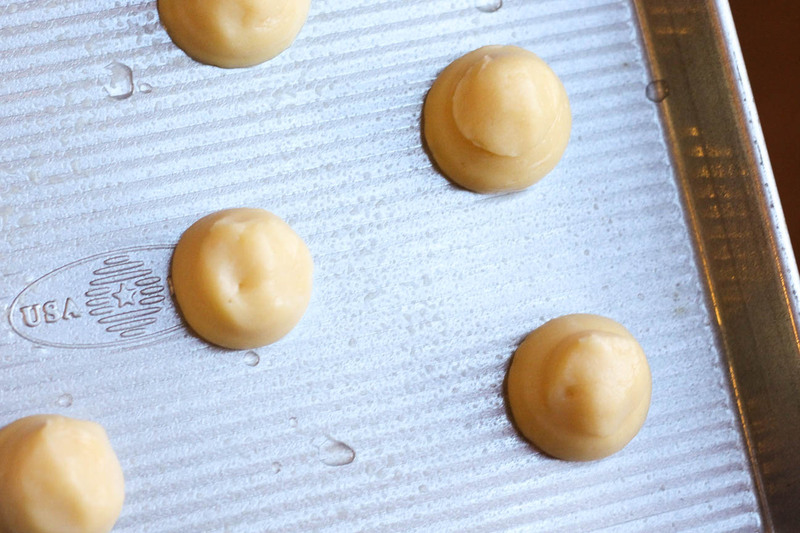 Set aside to cool to room temperature while you prepare the filling and fill the puffs. In a medium bowl, beat together the instant pudding, milk, and heavy cream until the mixture is thick and has soft peaks. To fill the puffs, you can either cut them in half and spoon the filling in, or use a piping bag with a small tube tip to fill them from the bottom or sides. Be generous with the filling, you'll have plenty! 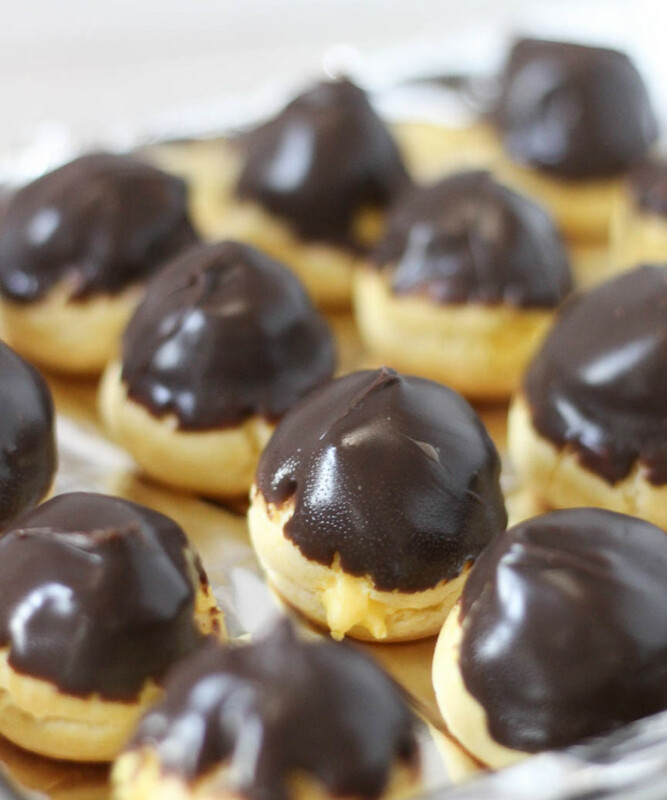 Once the ganache has come to room temperature and is fairly thick, dip each puff into it. Chill the puffs immediately, and serve and store cold.